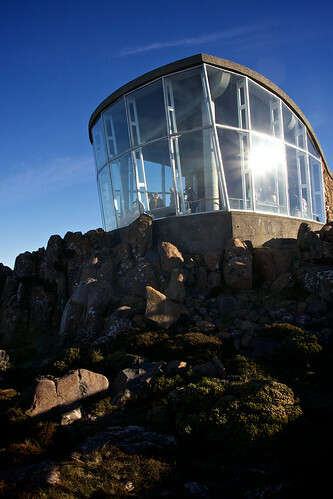 Mt Wellington Observatory a photo by BaboMike on Flickr. Busy day today. Up early for a Saturday (8.30). Breakfast at home then down to the world famous Salamanca markets. Such a long walk for the morning, it took at least 4 minutes to get there. Oh the pain of it. So. Brekky at home, lunch at the fabulous Italian Pantry (awesome coffee, amazing panini and amusing 1985 Gourmet Australia magazines). Afternoon? Up Mt Wellington. Probably my favourite part of Hobart. It was absolutely the perfect day for it. The weather was clean and crisp, a few wispy clouds high up, some low down clouds riding the sides of the mountain. Perfection. Well, except for the absolute flood of rental cars up on the plateau. It felt like every tourist was up there at the same time. Busier than the markets almost. Every time I visit Mt Wellington, weather be good, bad or foul, I love it. It keeps changing. I know its just a big lump’o’rock, but it does feel like it has a real personality. Looking at it multiple times every day its never the same twice. Some days you can’t see it, or even believe its there, others it positively glows in the sunlight. Today was no exception. The drive up, the bright moss in the golden sunlight, water streaming out of a million holes in the rock (thanks crazy rain). I think I just want to go up there, take a book and sit besides a rock (out of the wind of course) and just sit and read for hours. Tomorrow, Richmond. And tonight? It was pasta and wine with a chicken on the label.